For all sorts of interactive doo-dads you will be creating, chances are you will be making heavy use of the mouse (or another pointing device like a stylus or finger). Something you may find yourself needing to do is figuring out the exact position of the click. 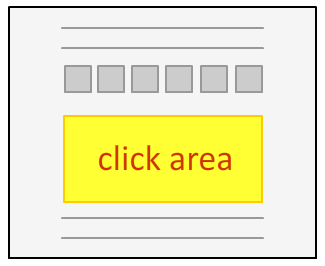 Click anywhere inside the gray box to see the red circle move to the point of your click. In this tutorial, I will explain the magic behind figuring out the exact pixel coordinates of where a click occurred. While the words "mouse" and "click" will appear often, just know that everything I show here works on a touch device where a stylus or your finger is the pointing thing! A great way to learn is by understanding why something doesn't work the way it should. In that thread, let's start by looking at a seemingly fine approach that seems like it should give us the exact position of the click. Notice what this event handler contains. It contains two variables whose values are the contents of our event object's clientX and clientY properties. 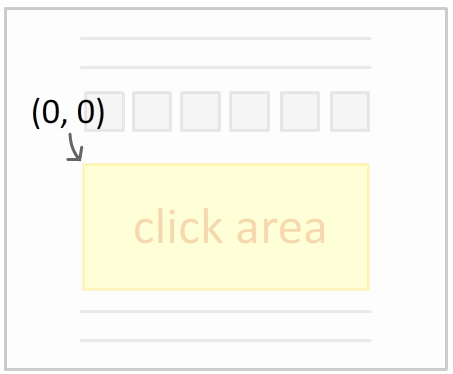 These properties return the X and Y position of the click. That is their documented behavior, and that is what they actually do. Sounds exactly like what we are looking for, doesn't it? It is neither global nor relative to the browser, so the value you get is only partially accurate for what you are trying to do. You want the X and Y position based on the top-left (aka the starting position) corner of your document. It is this value that gives you the exact position of your click. It is this value you will need when using the position for doing clever things like moving an element to the point of the click. The solution is pretty simple. What we need is to do some more calculations to make our partially accurate answer fully correct! The full solution involves combining the values returned from clientX and clientY that you saw earlier with the positions of every element in the DOM going up to your window object. That sounds complicated, but it really isn't. To get the position of all the elements between what you clicked on and the document, you have the getPosition function. This function provides you with the additional pieces of information needed to make your existing calculations involving clientX and clientY complete. All you need to do is pass in the element you are starting your measurement from. Inside an event handler, that element can be accessed by the currentTarget property. Well, that is all there is to this little tutorial. Getting the click position of something seems easy, but as you saw, it involves a lot of interesting factors that you need to take into account.